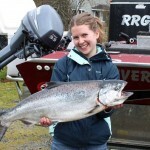 Kalina Craig with an great “Spring” Chinook on 3/26. 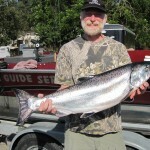 Nice winter Steelhead on 3/6/2012. 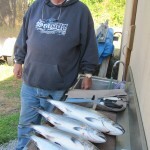 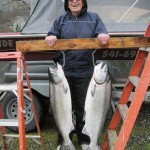 Bill can no longer hold up his salmon, but at 91 years of age, he still has the ability to land them on 4/12/12. 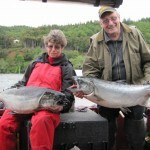 Gail Craig & Mike Wemple caught 4…2 were wild ! 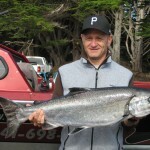 Sunday afternooner…stroll in the park with Mike’s new friend Spike. 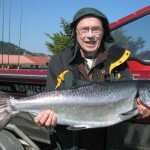 Bruce Riter with his first ever Rogue River Chinook Salmon. 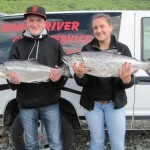 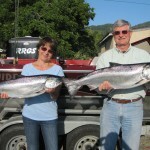 Ken & Bonnie Hemphill caught three Chinook salmon in two hours on June 7th. 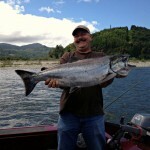 Mike Wilson from Tacoma, WA caught this beauty on June 19th. 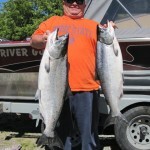 Mike Wilson with his nice limit of Chinook salmon on June 20th. 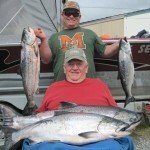 Mike Wilson and Jerry Weidert with their limits on June 23rd. 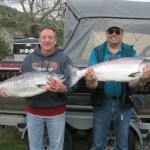 Three Chinook salmon, all on Chuck Ceccarelli’s rod for a great time on the Rogue Bay! 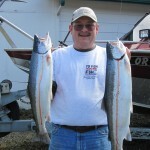 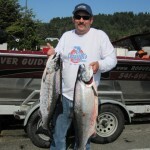 Greg West from Phoenix, AZ returns to the Rogue Bay for trolling Chinook Salmon. 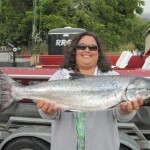 Bruce & Gudi Riter with her first salmon ever on 7/26. 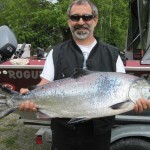 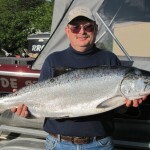 Kenny Hemphill caught this 38 1/2 lb “KING” salmon on July 28th. 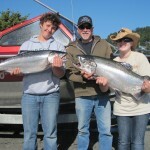 Proud grandpa, Eric Quinn with Jesse & Millenna with two great King salmon on 8/1. 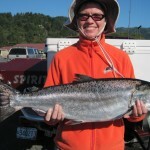 Millenna Quinn caught this true King. 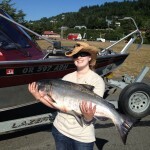 This is Millie’s first salmon ever at 32 1/4 lbs. 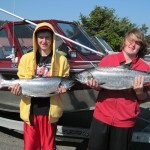 Chris & Josh White each caught their first salmon today. 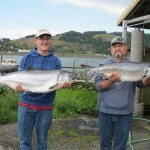 The White brother’s are from Grand Junction, Colorado. 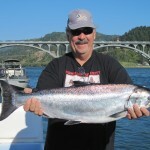 Gene Minikle has a new friend… invited to a special family meal on 8/24. 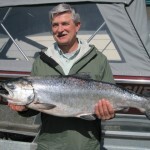 Glen Gertson with an awesome Rogue Chinook. 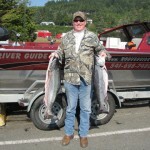 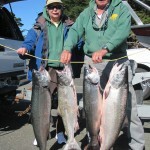 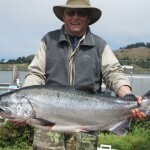 Barbara and Larry Bakin caught their limits of Chinook salmon on Monday, 9/10/112. 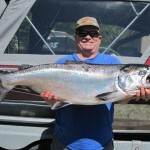 Mike Murphy from Salem, OR with a nice Chinook on 9/12/12. 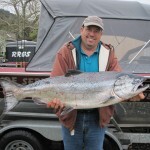 Charles Hess from Pennsylvania with his first ever salmon 9/13. 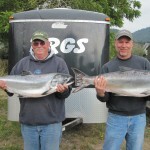 Dan Browning (Roseburg) and Nick Prater (Arizona) had a great day on the Rogue 9/19.